NutraTender is a fully chelated nutrient solution and is designed to be used as a foliar fertilizer for wildlife food plots, turf grass, pastures, and for use on any crop. 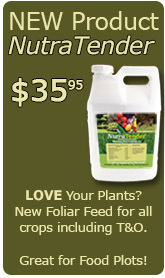 NutraTender has an optimum blend of nutrients to supplement plant growth. NutraTender also includes a dormant spore-based liquid containing special secretions that are very beneficial to soil bacteria. NutraTender is labeled for use on the following areas but always consult the label for specific information.